You’re probably gearing up to box away your hats and scarves and bid your chunky winter sweaters adieu. Soon enough, you’ll be sporting light denim, cute dresses, strappy sandals, and what else? Florals, naturally. Spring is a blissful time full of life and color, and your wardrobe should reflect and embrace that spirit. This season, we’re all about bright floral patterns on flowy blouses and sheer chiffon pieces, featuring billowy sleeves. We took inspiration from yellow marigolds, pink poppies, and red roses to bring you unique prints that go way beyond your average floral arrangements—think one of a kind, vibrant designs you can stand out in. 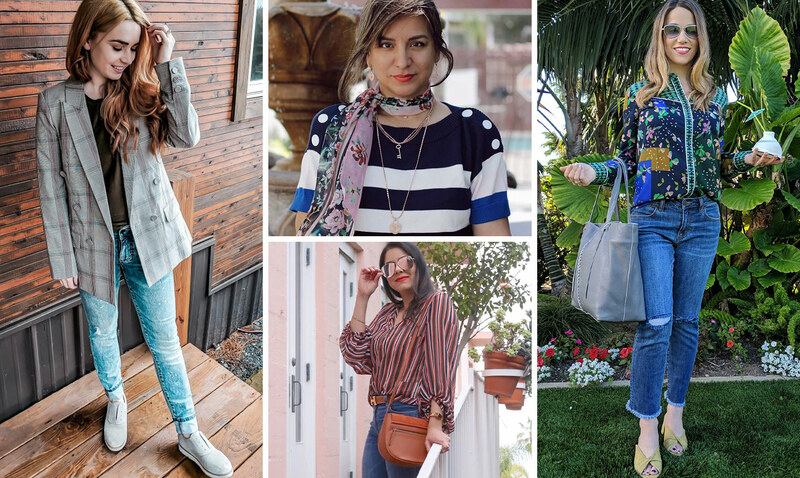 We’ve picked a few of our favorite Spring pieces to highlight along with styling suggestions to help you spring into the season to come. Take a look below! Cast against a stark black background, the pink petals of our new Petal Blouse really pop. This chiffon blouse is lightweight, slimming, and features darling cap sleeves and an elegant V-neckline. 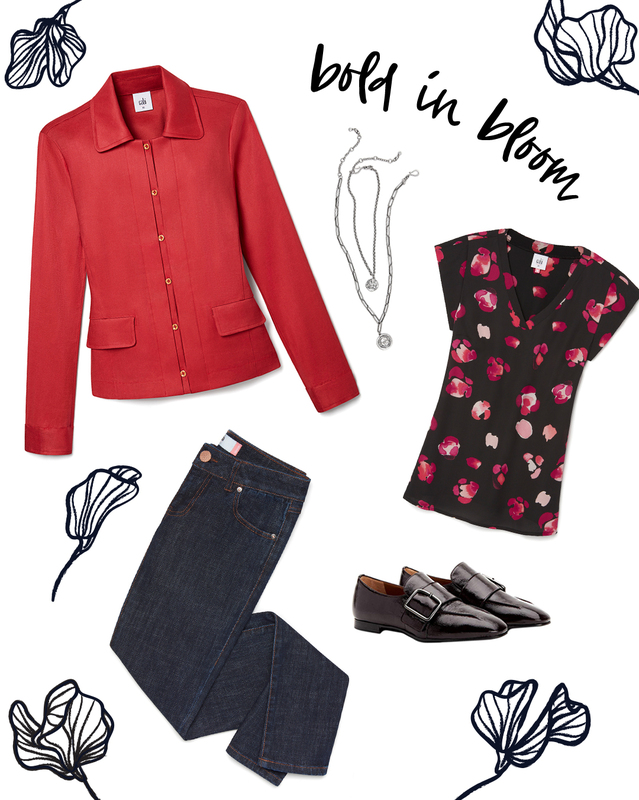 Throw on our crimson red linen Valentine Jacket to match the floral pattern, and pair it all back to a classic skinny jean. Your day will be as bright as your outfit, we promise! Our navy chiffon Dream Dress is an elegant floral option for spring with its maxi hemline, three-quarter sleeves, empire waistline, and a crossover front design. If the bold spring color trend simply isn’t for you, this darker floral dress is just what you’re looking for this season. Accessorize with the Safari Belt around your true waist, and add the white Castaway Jacket. 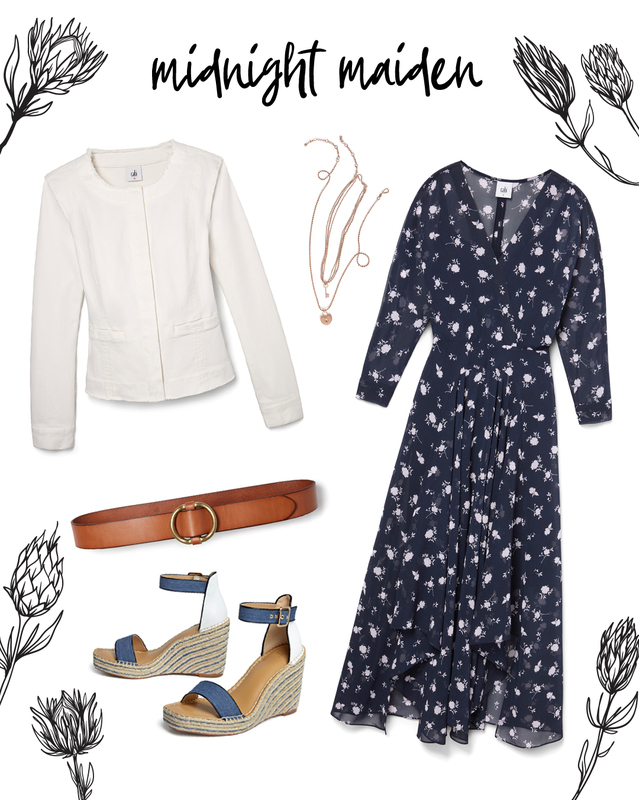 Finish off this night sky ensemble with the Parker Wedge and you’ll be ready to dance the night away! Be vibrant this season with our multicolored Wraparound Blouse. This layered, printed chiffon tank features a floral gradient with pink, royal blue, and marigold hues. Playful in both design and print, this blouse is the perfect pick-me-up for a rainy spring day! Pair back to our Slim Boyfriend jeans and long, ribbed, and navy body-skimming Counsel Cardigan. Last but not least, match the blouse to a block heel slip-on sandal like our Marigold Mules. We love an alternative vintage silhouette like our delicate Spring Blouse. With ruffled shoulders and a high neckline, it’s simply perfect for a romantic evening. Wear this orange falling poppy pattern and sheer fabric combo over a navy cami for a perfectly balanced look. Wear it with our Cinch Skinny jeans and our edgy navy Chance Jacket, featuring an asymmetrical black zipper detail. Then let your little ankle booties tie it all together—love! The gilded floral Scene Blouse is an adorable option for spring, featuring billowy three-quarter sleeves and a crawling vine pattern. We love how the sheer fabric stands out over a dark-colored cami. This leafy top comes in an eye-catching mustard yellow that goes great with our army green Expedition Jacket. 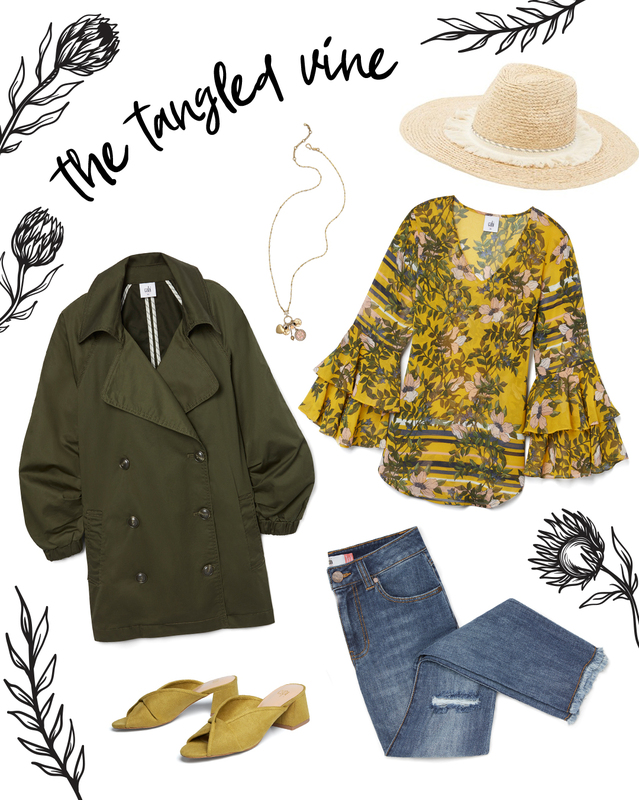 Try styling this outfit with our Cropped High Straight, a straw hat, and our Marigold Mules to tie the yellow back in. 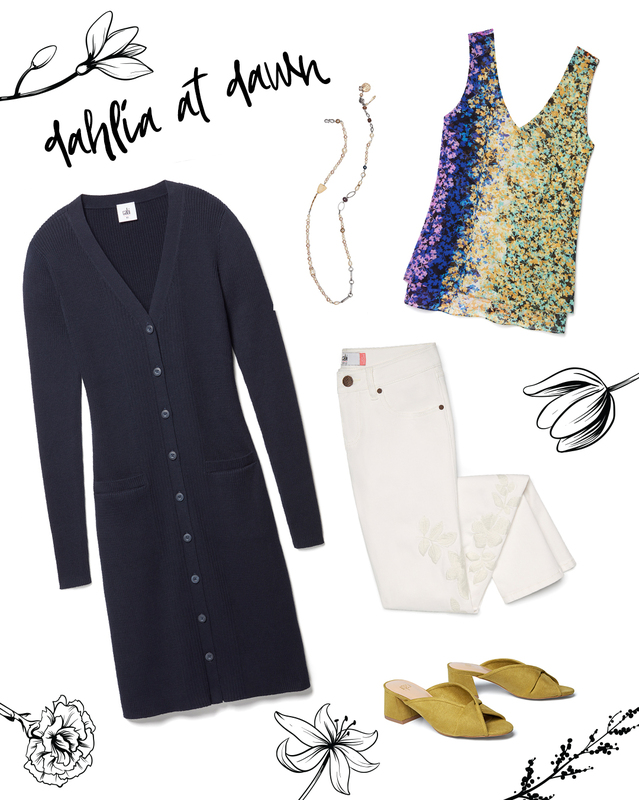 Spring is in the air, and we’re itching to change over our closets and break out some of our new favorites. 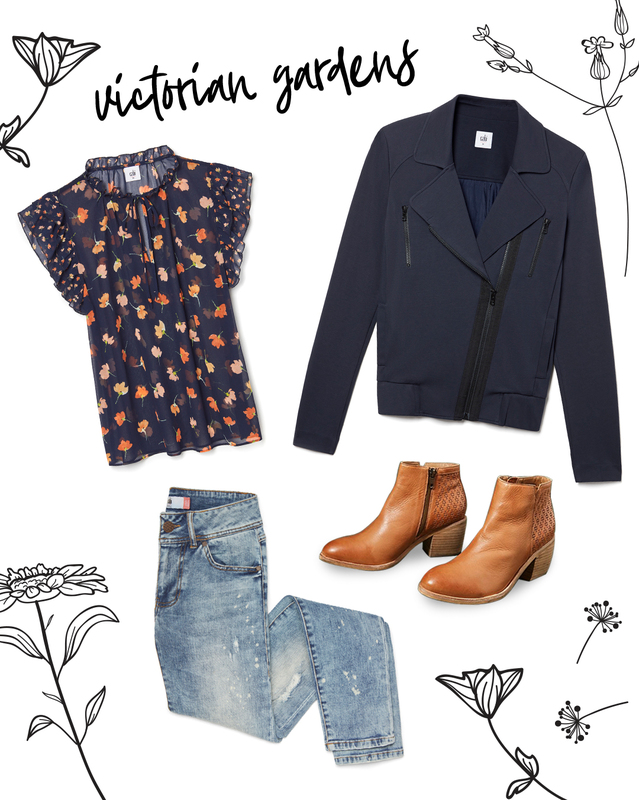 How do you plan to incorporate funky florals in your wardrobe this season? 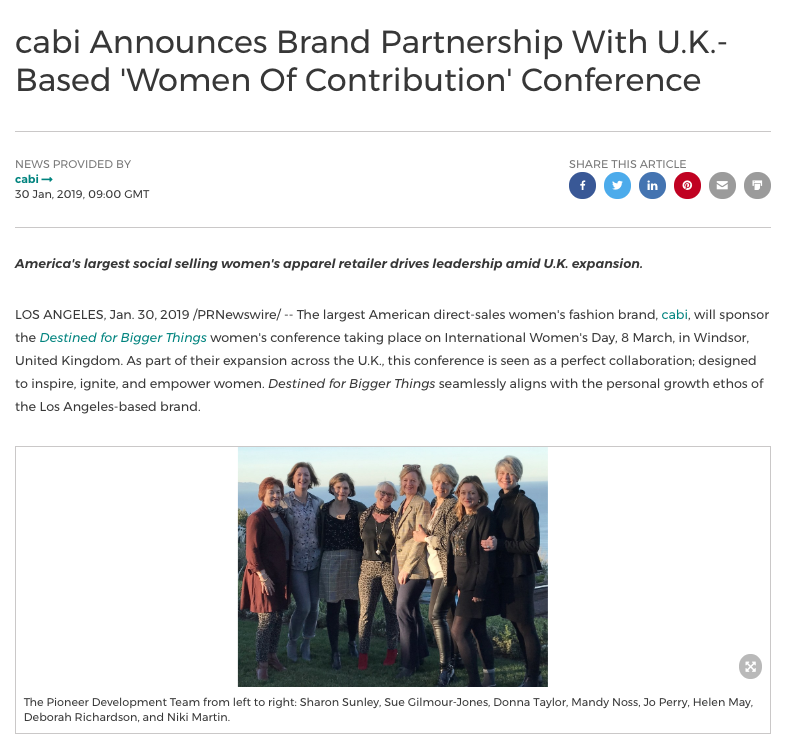 Snap a photo, and post it on Instagram @cabiclothing #floralflourish to share your ideas!